Angie's Boomchickapop snack products want you to enter daily for a chance to win electronics like a MacBook Air, an iPad Mini 2, back to school gear, yummy snacks and more! First Prize (6 total; 2 per Drawing): One (1) 11-inch MacBook Air; one (1) Boomchickapop branded MacBook case; one (1) Boomchickapop branded skin for MacBook; and one (1) BOOMCHICKAPOP Big Bag filled with 25 BOOMCHICKAPOP Sweet and Salty Popcorn 1.0 oz bags and 25 BOOMCHICKAPOP Sea Salt Popcorn 0.6 oz bags. ARV: $1,038.00 each First Prize. 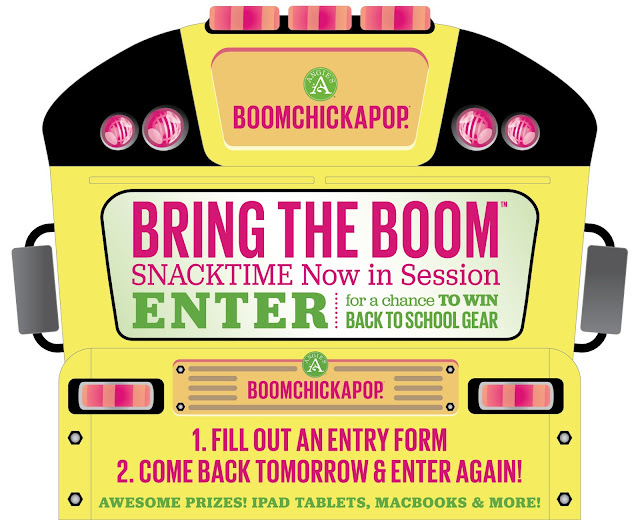 Second Prize (12 total; 4 per Drawing): One (1) iPad mini 2; one (1) Boomchickapop branded snap on case; one (1) BOOMCHICKAPOP 6 packs of Sea Salt; one (1) BOOMCHICKAPOP 6 packs of Sweet & Salty; and one (1) bag each of BOOMCHICKAPOP flavors: Sea Salt, Sweet & Salty, Lightly Sweet and White Cheddar. ARV: $312.77 each Second Prize. Third Prize (72 total, 24 per Drawing): Boomchickapop branded backpack; one (1) Boomchickapop branded Bento lunch Box; one (1) Boomchickapop branded journal set with pencils; one (1) BOOMCHICKAPOP 6 packs of Sea Salt; and one (1) BOOMCHICKAPOP 6 packs of Sweet & Salty. ARV: $99.98 each Third Prize. This Sweepstakes ends on 12/15/16 and you can ENTER DAILY to win.